Finished in 6:47 (official time); A new PR since I've never done a mile race. It was the first time I've ever run a one mile race. It was fun to see how fast I could go. Despite my slowness, I was racing it. Haha! It was a fun time and a cool medal. For $20, it was worth trying it. The Crim 10 mile has always been an excellent race and one of my favorites. Even though the distance is 10 miles, it feels more like a half marathon with the crowd and hills. This was my third time running the 10 mile and I've never had a bad experience. It's a race I will do again for sure. Because I was able to work that day in Grand Blanc, which was 8 miles away, I went to pick up my race packet on Friday at lunchtime. If you have never been to downtown Flint, you would be pleasantly surprised as the downtown area as well as the University of Michigan campus is very nice. 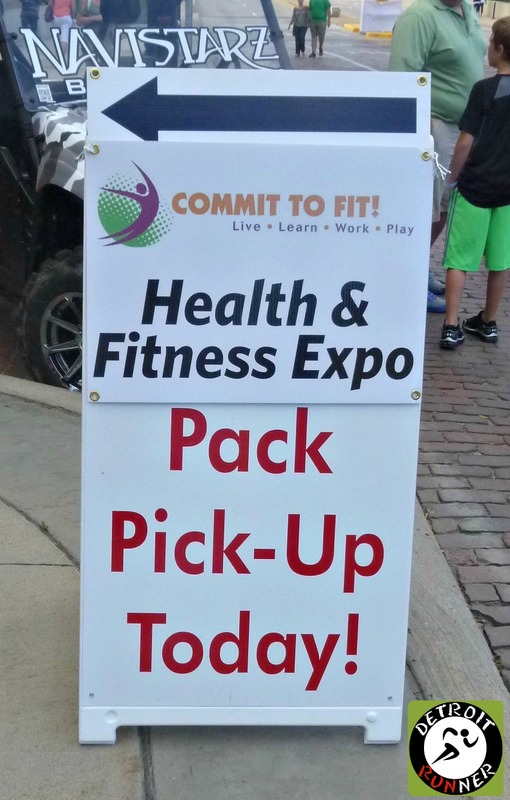 Packet pickup has been at the same location at least since I've been running the race and its very easy to get in and out. Has always been in the same place, so easy to find. This is actually one of the larger expos that I've been too. You would not think it would be so large but its bigger than many marathons. The 10 mile race draws people from around the world including several Ethiopian and Kenyan runners. It's not surprising to see the large expo since they were expecting over 15,000 runners this year. I'm in the right place! The race has you wind through all the vendors so you can see what they were offering(kind of like Disney but in reverse). 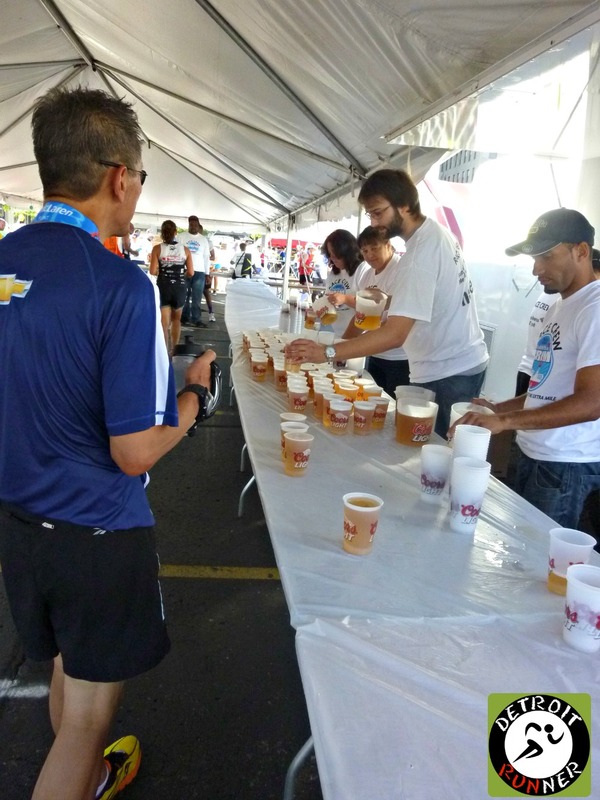 If you've been to a marathon, then you know that they have all kinds of vendors related to running merchandise as well as other local races talking about their race. They usually have some good deals on stuff, and I looked briefly, but really did not spend much time going through everything. I did pick up some freebies from the vendors which is always nice to try some new products. The race was also selling shirts from previous years. They had last years tech shirt for only $2 - an outstanding deal - but I have a thing about wearing a race shirt I have not run so I didn't get one. There was a good variety of stuff to buy though and a runner could go crazy in there. Once you made your way through the vendors, you could get your race bib number in order to get your packet. As you can see, there was lots of runners doing this race. After you got you number, you went to the volunteers to give them your number and they pulled out your bib and some pins. You then made your way over to where your shirt was located. The race is very accommodating and allows other runners to pick up friends packets so I also picked up my running buddies. Then I got in another line to get my one mile race bib and shirt. I made my way back that evening and was able to park right at U of M which was only two blocks away. I couldn't say the same for the 10 miler. We got there at 6:30am on Saturday morning and they had already closed many streets so we ended parking about a mile or so away. It still was not too bad. The race also offered a shuttle if you parked where they wanted you to but we didn't want to take it. The one miler was Friday evening. They had several events going on that evening with the one mile. They started with a race for the Special Olympics and I'm so glad I could spectate for this. It was truly inspiring seeing the participants run their races and how much fun they were having there. I found myself tearing up as the crowd was so loud and cheering for all of them. The race had everything set up for the one mile race afterwards. Since I had time, I strolled a little down the sidewalk to keep my legs moving so I was somewhat warmed up. They already had the port-o-potties all set up near the start area. Huge crowd for Special Olympics/pros/us regular Joes! After the Special Olympics, the professional milers were up next starting with the men. The men's winner finished in 4:05.59 - an incredible time. Even last place came in at 4:26.60 - haha! I would have loved to see them finish but I could not get to the start of my race fast enough so I just took pictures of them starting. The guys look effortless and their form is something every runner desires. Up next were the women with the winner coming in at 4:47.27 - another amazing time with last place coming in at 5:01.27. It was fun to see the pros warming up and racing. There was also a high school challenge which went just before the open mile. Next up was us regular people. Now I have to say that in a normal race, I would never, ever line up near or at the start especially with the amount of runners(over 1000). I just don't have the speed to compete with top runners. However, after looking around at the runners, there were many kids and people that likely were not going to be running that fast and I was looking for a PR. I was talking to another runner who was concerned with the same thing and thought we should be more up front so I went with it. He even said something to a Dad with his two smaller kids and the Dad said, "You can run around them." Not a wise decision on his part to put his kids in that speed. We moved in front of them and he was not too happy about it but we didn't want them to get run over. While there was an announcement about where to be based on your pace, it seems many just ignored it so I went near the front. Given my place overall, I think I made the right decision. Please keep in mind that this was a competitive race and was not a kids fun run. It was not labeled a fun run but competitive. As you can see, a couple quick turns and you're done. I'm sure the times would have been slightly lower had it been a straight mile without turns. Not much to the mile except, well, one mile. 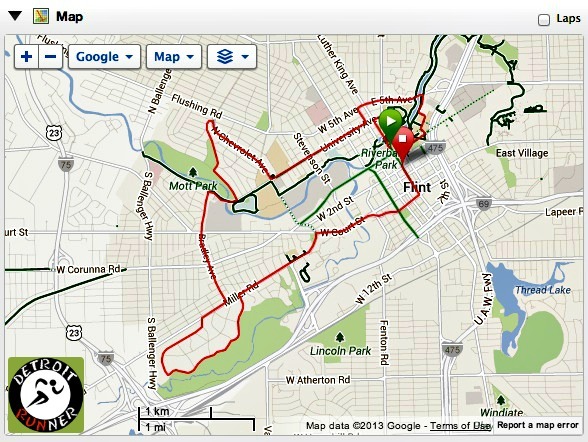 The course took you from downtown and around U of M and finished on campus. From the finish, we walked back downtown for the after party. 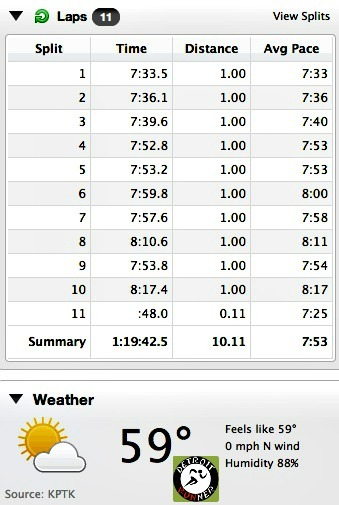 The pace on the my Garmin shows faster given the course showed a little long but I'm very happy with my 6:47. The one thing I was worried about was the weather. 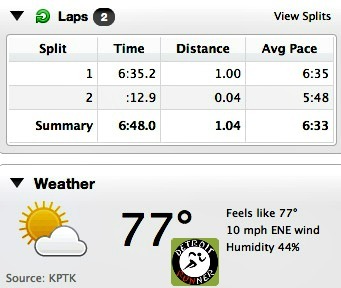 At 77 degrees at the start, while I knew it could be worse for an August day, I thought it would slow me down. I rarely run in that warm of temperatures or that time of day since I'm a morning runner. Fortunately there was a nice breeze and it did not feel as warm so it worked out great. I went out super fast and was just following the crowd but I was only able to keep that sub 6 minute pace for about 0.20 mile. My lungs were on fire! I was breathing really heavy and could not catch my breath. Wow! The mile is a really hard distance to run if you really do try and race it. I wasn't really thinking about my legs much because everything was over so fast. Before I knew it, the finish was there and we were done. Yes, I drove an hour there and back to the race that evening for a less than 7 minute race and it was worth it! I had a blast. As you can see, there's not many course pictures but its just too short of a race to get too many. Considering my pace, it's pretty hard to concentrate on the camera - haha! I got one about the half way point and then near the finish. You can see how many people were at the finish line to see us come in. Great day considering it's August - about 1/2 way there. None for the Michigan Mile since it was only a one mile race. The finish area was quite small(as you can see above) but the race was not really large either. It was really popular and I could see this race getting really large over time. It was a beautiful night and I took a picture of the river next to the finish area before walking back to the food area. After the race, I grabbed a piece of pizza and a water. I was starving since I didn't eat dinner. I saw Alexis from Get2fit2quit after and we talked paces for a minute and I was in a hurry to get home. Why you ask? To do this all over again the next day for the 10 milers. I headed home and got to bed for an early morning. The next morning started at 5am. I went to pick up my running buddy and we headed back to Flint. We got to the race about 6:50am and they had already closed the streets so we ended up parking over a mile away but it still worked out good. It's a good thing I picked up our packets the day before because we never would have made it back to the car with our packets and back to the start area in time. We did get a nice walk through the U of M campus on the way to the start area. We made our way to the bathrooms. That took about 25 minutes and then we got into our corral which was corral B(second to start). The race started the wheelers and then the 36 year runners which were people who have run all the Crim races. Very inspiring! The race did a great job enforcing the corrals as they had volunteers looking at our bib which had our letter on it. We were able to get a good spot and the runners were all placed great since I didn't have to run around hardly anyone. This was a big improvement since the last time I ran the races when they let everyone go at one time and there was not much organization for start times. Letting the corrals go out one at a time really helped reduce past years congestion - it was a great improvement. This year was also a modified course and I thing it's much better. 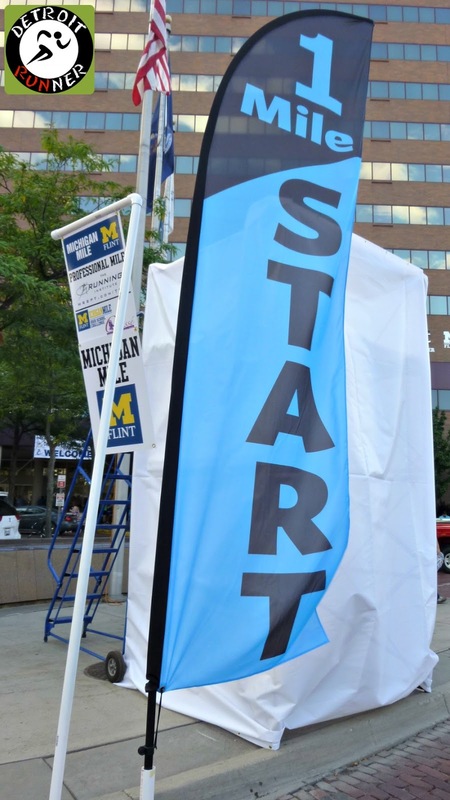 We get to start out running through U of M's campus which was a great way to start the race. It was a big improvement. I had decided that I would run with my running buddy and he was saying a 1:20 goal. I was happy with that. We took off so fast in the first three miles and I was not planning for my running buddy to start so fast. Regardless, I ended with a sub 1:20 so I was happy with that. While I did push myself harder than I would had this just been a training run, I felt really great finishing a little over a minute longer than my PR for the 10 mile. When I got my PR, it was at this race two years ago. I had only run about 18 miles that week before the race and also took off a day before the race too. Given that I had run 33 miles this week before the race, including the race the day before, I feel like my running condition was pretty good. In addition, I have not been running many hills this training cycle and, given the hills in this race, I feel I took them pretty well. I know had I really pushed hard, I could have pushed for a new 10 mile PR but it was not that important to me. The race still helped me gauge where I stand physically - better than two years ago but probably not as strong as I was this time last year. It was a perfect day with a starting temperature of 59 degrees but there was a bit of humidity. That's a dream for August in Michigan as sometimes it's close to 80 at the start. I tried to keep the pace fairly consistent after the first three miles. 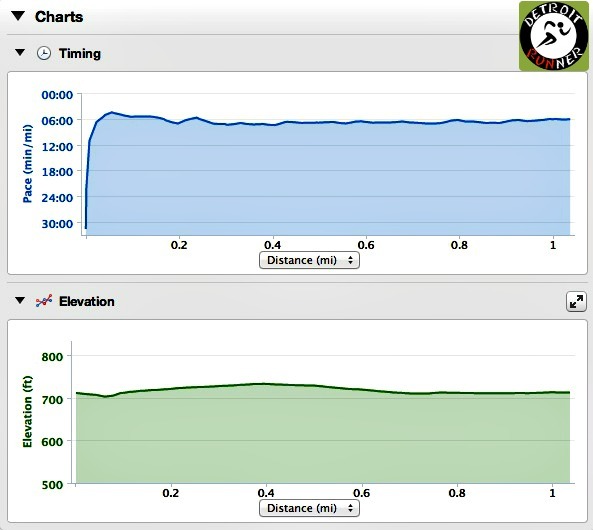 I don't know what happened in mile 8 considering it was not even that hilly there. The last mile, I could feel my muscles becoming fatigued and slowed the pace a bit, not because I wanted to. 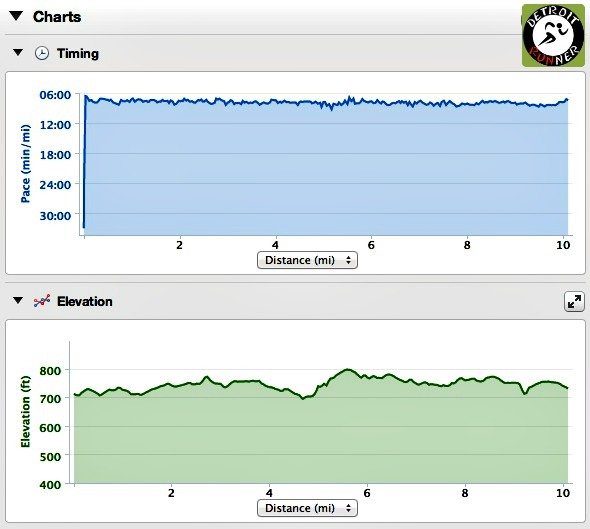 As you can see from the elevation chart, half way through is a nice hill. If you have not run this race, don't be scared of the hills. Yes, this is a challenging course but it's one that everyone should do at least once. We start downtown on the bricks. It's gives you a great feeling running on them knowing how old they are and the history behind them. You will notice a couple things in the picture below. First is the blue line that is not only across the street to mark the first mile but also the mile marker sign to the right. These are permanent signs like street signs! I've never seen that in a race before. I wonder if they keep them up all year so runners can run the course all year. The thing to notice is the other blue line along the street. Just follow the blue line from start to finish and you won't get lost. You will see the blue line throughout the course pictures. I've also never seen this throughout the race course. The race also has lots of police support and entertainment throughout the course. 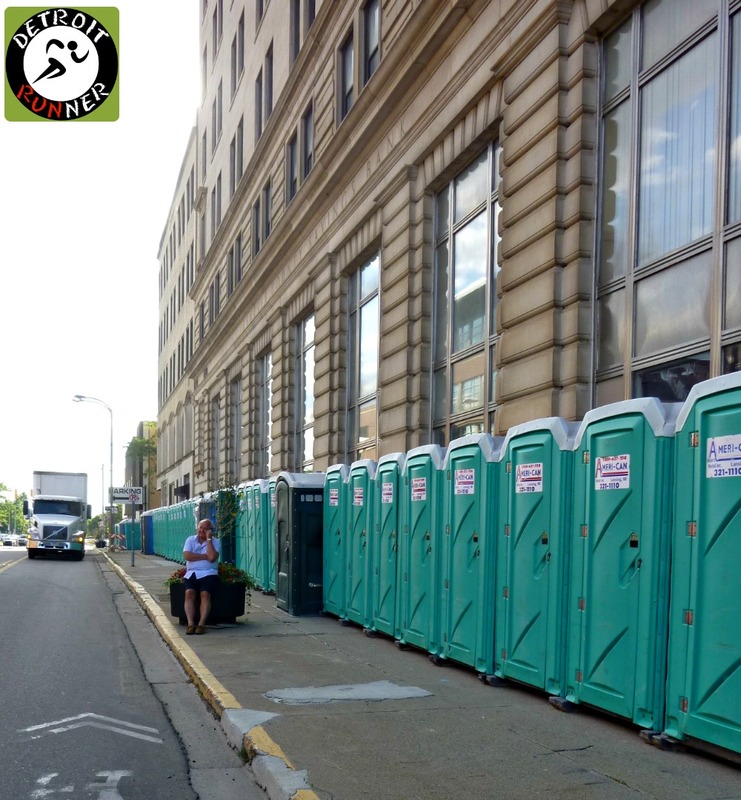 They also have plenty of port-o-potties along the course and lots of hoses to run through that many of the residents put out for runners. Speaking of that, many of the residents also come out to spectate and cheer on the runners. The entire city backs this race and you can tell the whole way through running it. One new thing, at least to me, was the Bradley Hill challenge - King and Queen of the Hill. The Bradley hills are a stretch of the race that is very hilly at the 5-6 mile mark. The challenge was to see who could run up the hills the fastest. I think they were giving money away for it as well. I didn't even come close to the top - haha! I was about twice the time as the fastest time. Oh well, regardless, it was fun! The below picture gives you a good idea of the hill going up it with the balloons being at the top of this hill. As I mentioned before, here's a better picture of the permanent signs. 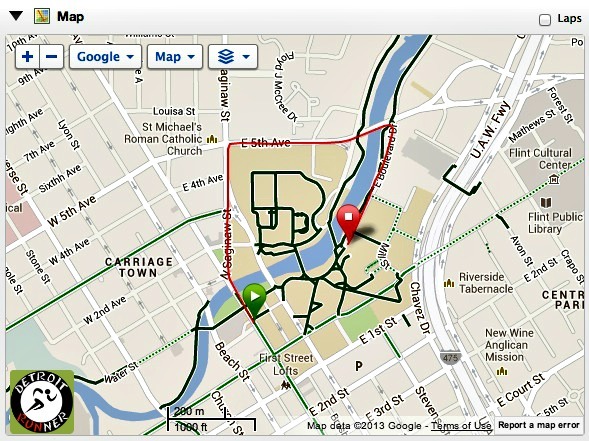 This shows the direction for the 10 mile and 8k course. Wow - that's impressive. I'm a sucker for an American Flag - it gets me every time. We passed this wheeler working his way up this hill and people were very encouraging. It looked really tough to get over the hill and I'm sure his upper body strength was incredible. One of the best parts of the race is near the finish when you get back on the bricks again. The crowd is huge and is fantastic at keeping us runners motivated all the way to the end. The aid stations were plentiful! I'm not sure exactly how many there were but I would guess one every mile. They had many group out there volunteering and cheering us on and they were all fantastic. Here's just a few of the pictures I was able to capture of the stations. They offered water and Gatorade and the volunteers were all well organized. The finish area was incredibly organized and the volunteers helped keep runners moving through the line. Right after the race, they had ice cold wet towels which was nice. I've only had that at one other race for the Back to the Beach half marathon. Then they gave out medals. Food - water, bananas, granola bars and Popsicles were next. A nice cold Popsicle is a great way to finish the race. After this, next to the finish line, you could go through another line to get a beer/pop and a piece of pizza. When we finished, it was an easy in and out through the beer/pizza line and was not busy but we passed it later and there was a huge line waiting. Tim Hortons and McDonalds were also offering free coffee/donuts and smoothie samples. Onto the food - at the white tent! My running buddy was also part of a team challenge, and with that, we were able to go to a special after party. 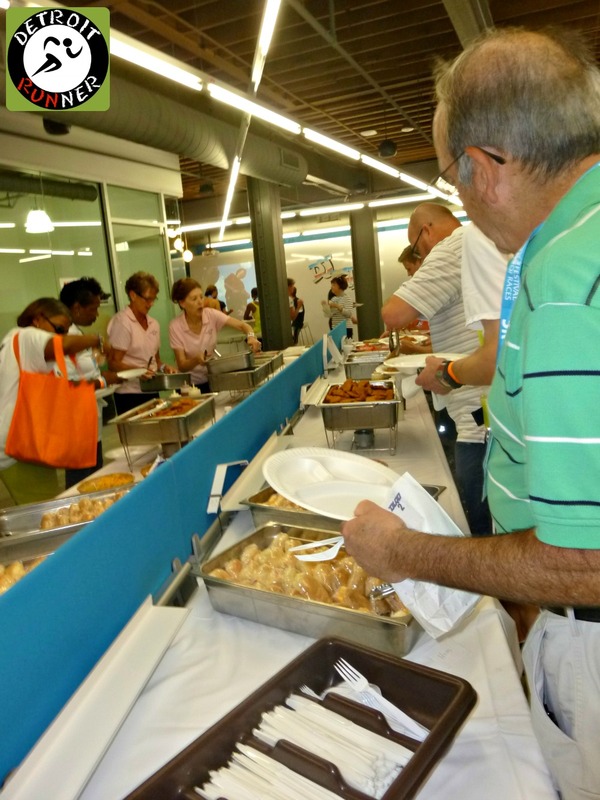 They had some really good food including sandwiches, potato salad, macaroni salad and desert. They also offered water and beer as well as some speciality beers. It was a nice treat that you don't get typically after a race. Unfortunately my running buddy was not feeling well after the race so we didn't stay there long but I was able to eat enough to make it my breakfast and lunch for the day. For your race entry, you received a race shirt. The Michigan mile is a 50/50 blend shirt and the Crim is 100% polyester. As you know, I'm not a big fan of white shirts, especially cotton, so it's likely this won't get worn much. You can see both shirt I already own from 2010 and 2011 at the bottom of this post. While the Crim shirt is supposed to be a tech type shirt, I would not wear it to run. Both the Michigan Mile and Crim shirt are the same front with the back indicating the distance. This is my third Crim and both other shirts were a runners, Brooks tech shirt that I wear all the time and one is a green color so they are nice. This years design is ok but previous years designs were incredible. I also received a few freebies that I've shown below. There may have been more freebies but I didn't look too hard at the expo for them. Free stuff - cool! A great giveaway! Ok, one of the main reasons I ran the Michigan Mile was for this awesome medal. Check that thing out! Really, really nice to have that for a short race like this and for such a low price. I'm sure many of the runners did the mile just for this. The Crim medal is also quite nice. It's a little smaller than previous years but its made very nicely and both ribbons on the medals are nice as well. In addition to the medals and shirts, you got a world class organized event. There was full police support and a certified course that was at least the distance promised. It had awesome entertainment throughout the course and a great finish line spread for both races. Given the Crim has been doing this for over 36 years, you got exactly as you would expect. A world class organization that was organized in every way. The organization has an excellent website, Facebook page and Twitter page. The communication is excellent with emails and information on social networks. The start line, course, volunteers, finish line, and food were superbly organized. It's why I came back for my third time as I've never had a poor experience with the Crim. Michigan Mile - overall a really fun race. I'd like to see them corral this race as well to help people line up. This would keep walkers at the back of the race. For the money though, this is a great value. 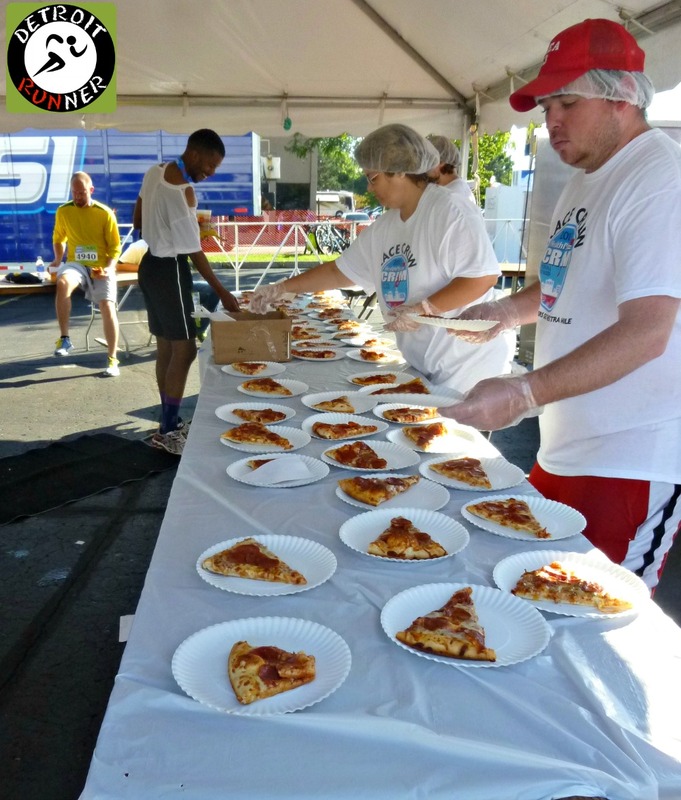 You can't beat a race shirt, medal(and not a cheap one) and finish line food for $20. One of the best values in races I've done. Crim - as expected, overall this is a race that every runner should do. If you run and you live in Michigan(and even if you don't), this is a must do race. It's worth getting up early and the price is also a value($40). You could also sign up for a package deal but I had already signed up for Crim before I decided to run the Michigan Mile so it would have been even less money. The course is a challenge but you feel great when finishing it. This continues to be one of my favorites. Nice job in both races. What a busy and fun weekend! It sounds like a wise move to get up near the front for the mile. It's really frustrating when people don't line up where they should, especially in such a short race. I like Trieu's shirt too. I need to sign up for one of the team challenges just to get that shirt, haha. Thanks for another great recap. For the food too Janet. The spread for the challenge teams was awesome! The Mile was kind of annoying. I had LOTS of little kids around me and I had to weave in and out of people A TON...even had to hit the sidewalk at one point because there were people walking in lines across the road. The 10 miles were actually really fun! This was my first time doing the Crim (or anything over 7 miles) and I had a great time! I would totally run this again next year! I agree the shirts were a bit disappointing. I signed up for both the races at once and it only asked for my unisex shirt size. I said Medium and received a Women's Medium for the 10 miler along with my 1 mile unisex shirt. The Woman's Medium barely fit me! Luckily though, I saw they had a shirt exchange and was able to get an XL on Saturday. Phew! Yeah, you should have come closer to the front in the mile. I have not even tried on the shirts yet but they usually fit for me(and most men) Glad you had a good time and congrats on the new distance! We never have any road miles any more... I have only ever run one and it was great fun, I love the mile distance, and I'm planning on hitting the track this coming season for a mile or 2!!! I hope you find another couple of local miles to run, I see a 6:30 and who knows, with a bit of mile training how about a 5:59???? Yes feeling pretty good about it all. Not many mile races here either Coach. I know you'd go sub-7 for your one mile!! Great job Jeff!! Your review definitely has me noting this race for my 2014 line up. Thanks. I'm surprised you have not run it. Nice recap, and nice photos along the way. For the record, no, the Crim signs don't stay up year-round. They usually put them up the Thursday before and take them down later Saturday or early Sunday. However, the painted mile lines on the ground tend to last through the year, so you can always run it by following those and, of course, the blue line. Looks like they had another great post-race setup this year. I'm sad I wasn't able to participate, but I had to hurry home, as I was co-best manning a wedding at noon in Ann Arbor. Thanks. I say why not keep them up but at least the lines are there. At least you got the run in.